Scrooge knew he was dead? Of course he did. How could it be otherwise? Scrooge and he were partners for I don't know how many years. Scrooge was his sole executor, his sole administrator, his sole assign, his sole residuary legatee, his sole friend, and sole mourner. And even Scrooge was not so dreadfully cut up by the sad event, but that he was an excellent man of business on the very day of the funeral, and solemnised it with an undoubted bargain. The mention of Marley's funeral brings me back to the point I started from. There is no doubt that Marley was dead. This must be distinctly understood, or nothing wonderful can come of the story I am going to relate. If we were not perfectly convinced that Hamlet's Father died before the play began, there would be nothing more remarkable in his taking a stroll at night, in an easterly wind, upon his own ramparts, than there would be in any other middle-aged gentleman rashly turning out after dark in a breezy spot--say Saint Paul's Churchyard for instance--literally to astonish his son's weak mind. Oh! But he was a tight-fisted hand at the grind-stone, Scrooge! A squeezing, wrenching, grasping, scraping, clutching, covetous, old sinner! Hard and sharp as flint, from which no steel had ever struck out generous fire; secret, and self-contained, and solitary as an oyster. The cold within him froze his old features, nipped his pointed nose, shriveled his cheek, stiffened his gait; made his eyes red, his thin lips blue; and spoke out shrewdly in his grating voice. A frosty rime was on his head, and on his eyebrows, and his wiry chin. He carried his own low temperature always about with him; he iced his office in the dog days; and didn't thaw it one degree at Christmas. No wind that blew was bitterer than he; no falling snow was more intent upon its purpose, no pelting rain less open to entreaty. Foul weather didn't know where to have him. The heaviest rain, and snow, and hail, and sleet, could boast of the advantage over him in only one respect. They often `came down' handsomely, and Scrooge never did. Nobody ever stopped him in the street to say, with gladsome looks, 'My dear Scrooge, how are you? When will you come to see me?' No beggars implored him to bestow a trifle, no children asked him what it was o'clock, no man or woman ever once in all his life inquired the way to such and such a place, of Scrooge. But what did Scrooge care! It was the very thing he liked. To edge his way along the crowded paths of life, warning all human sympathy to keep its distance, was what the knowing ones call `nuts' to Scrooge. Once upon a time--of all the good days in the year, on Christmas Eve--old Scrooge sat busy in his counting-house. It was cold, bleak, biting weather: foggy withal: and he could hear the people in the court outside, go wheezing up and down, beating their hands upon their breasts, and stamping their feet upon the pavement stones to warm them. The city clocks had only just gone three, but it was quite dark already--it had not been light all day--and candles were flaring in the windows of the neighboring offices, like ruddy smears upon the palpable brown air. The fog came pouring in at every chink and keyhole, and was so dense without, that although the court was of the narrowest, the houses opposite were mere phantoms. To see the dingy cloud come drooping down, obscuring everything, one might have thought that Nature lived hard by, and was brewing on a large scale. `Don't be cross, uncle!' said the nephew. Scrooge, the most miserly of all misers, is shown the true meaning of Christmas by four ghostly visitors - his partner Marley, and the ghosts of Christmas Past, Christmas Present and Christmas Yet To Come, transforming his perspective towards life forever. 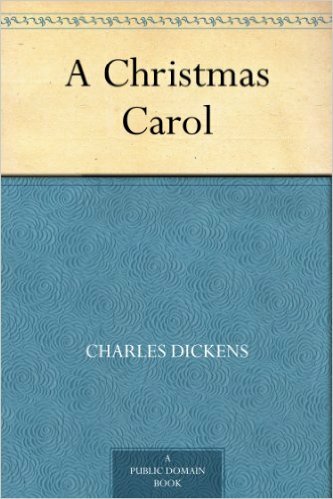 A supernatural Christmas classic, and one of Charles Dickens' most famous works.